The Texas Rangers have signed their first European grown player ever. 18-year-old Dutch middle infielder Nick Urbanus, who is currently playing for the Hoofdklasse club L&D Amsterdam Pirates, agreed on a minor league contract with the Major League Baseball organization. He will join the Rangers affiliate in the Arizona Summer League (Rookie Level) next June after graduating from Johan Cruyff College back home. However he won’t be the first Dutch player to join the organization. Former Amsterdam head coach Rikkert Fanyete played for Texas in the MLB in 1996. Andruw Jones who played for the Netherlands in the 2006 World Baseball Classic was with the Rangers in 2009. Mike Daly (Director of International Scouting) and Jim Colborn (director of Pacific Rim Operations) are enthusiastic about the choice of Urbanus for the Texas Rangers. 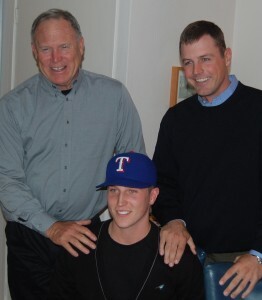 “The Texas Rangers are very excited to get a player with his abilities and character” said Daly. “Urbanus is such a famous name in the history of Dutch baseball and we are delighted to have been able to add Han’s grandson and Charlie’s son to our organization as our first European player,” added Colborn. Grandfather Han Urbanus and father Charles Urbanus Jr. also played Baseball, winning multiple MVP awards in the Netherlands. Nick Urbanus made his debut in the Hoofdklasse in 2009 at the age of 17. Later that year he also played for the Senior National Team at the World Port Tournament in Rotterdam. In 2010 he batted .236 (OBP .278/SLG .287) with one triple, six doubles, 17 runs scored and 19 RBI in 42 games for the Pirates, where his father is the head coach.